Smoked Mussels with Spinach, Garlic and (yes) BBQ Rub. Perfect for a romantic night at home, or to wow guests at your next party. Smoked Mussels and Oysters can be expensive to order at restaurants. If they are available at your local grocery store or seafood market, it is easy to make delicious recipes at home. Whether you grill with Gas, Wood or Charcoal, there are many ways to infuse the dish with a nice smoky flavor. You can take these fresh Seafood flavors farther by using a well balanced California Gold BBQ Rub for seasoning. POWER Rub comes with Lower Salt and Sugar and contains 15 ingredients, including Ginger, Cocoa and Garlic. HEROIC! has no added Salt or Sugar, and is made of 11 Superfoods, including Red Bell Pepper, Thyme and Garlic. Both blends provide an easy way to enhance all types of Seafood. 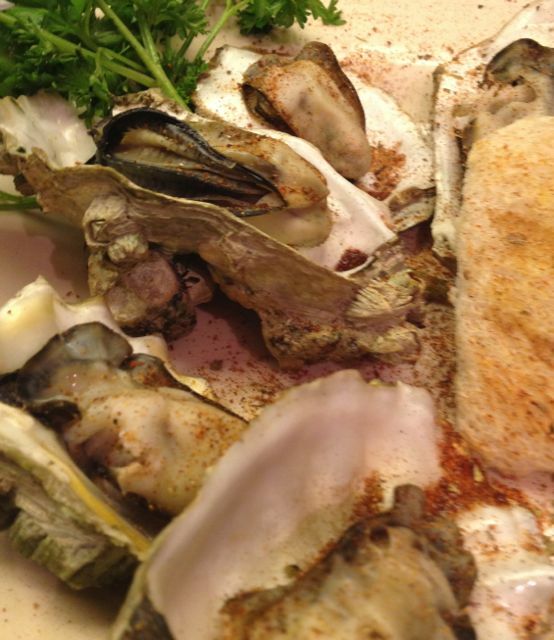 Smoked Oysters are simply delicious with just a sprinkle of BBQ Rub and Lemon Wedges. 2. For Gas: Follow Lighting instructions:-Preheat one half of Grill to Medium. For Charcoal -Pour in 1/2 the bag of Charcoal (4 lbs.). Stack Coal into a Pyramid at center of Grill. If using fluid, squeeze some into center of Pile, and then evenly over the outer Coals. With Cubes, put in two to three spots. Light fire. It will take about 15 minutes until Coals are ready for Cooking. When coals are ready, carefully shift them to one side of grill usings Tongs and/or Spatula. 3. Add 1/4 cup soaked Wood Chips to smoking element (box or on coals) Gas Grill- May use foil pouch/ pan. Never put Wood Chips directly on gas/electric coils. 4. Lay Bacon Slices on grill farthest from heat, then place Foil Baskets or Pans of Oyster/Mussels on unheated middle, next to (not directly on top of heat). 6. Replenish chips as needed (every 10-15 minutes) to maintain smoke. 1. Rinse off Fresh Seafood, removing any traces of sand. 2. Place Oysters and Mussels in single layer in a aluminum pan or make your own double=ply foil basket(s). Tip- Odd shaped Oysters may stabilized by propping with Mussels. Some people use Course Salt and/or add Fresh Herbs (Thyme, Fennel, Rosemary or ?) to pan. 1. Lay Bacon Slices on grill farthest from heat, then place Foil Baskets or Pans of Oyster/Mussels on unheated middle, next to (not directly on top of heat). 2. Allow Seafood to Smoke on Grill for 12-15 minutes.3. Check in about 8-10 minutes, flip everything once Mussels start to open. Replenish chips as needed (every 10-15 minutes) to maintain smoke. Also flip Bacon. 3. Smoke for another 5-7 minutes until Mussels open up. 4. Remove pan from grill. 1. In small Bowl, mix Softened Butter (or Margarine) with Garlic and Thyme. Season with Salt Pepper, and a sprinkle of BBQ Dry Seasoning. Spread mixture over each side of Bread. 2. Grill whole slices and cut in half diagonal after grilling. If making Heart Shaped Toast, use Cookie Cutter to shape bread. 4. 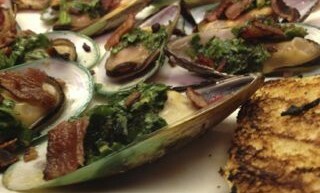 Once Mussels are open (from grilling), remove top shell and put pinch of Spinach/ Butter Mixture onto each Mussel. Then return them to Grill for 3-4 minutes, until butter melts. 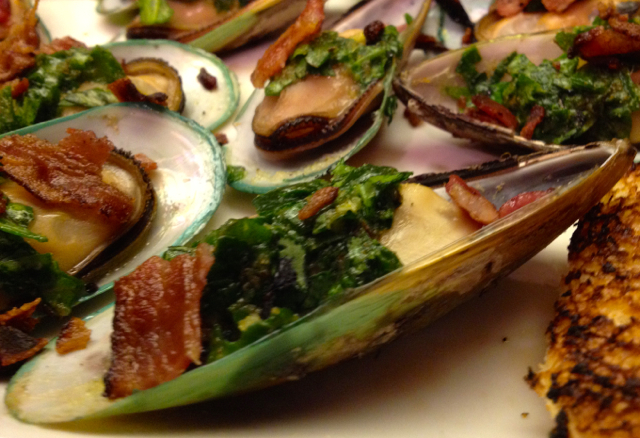 For Mussels- Place on platter, sprinkle with Crumbled Smoked Bacon. Garish with Toast, Lemon and Green Herb Garnish (if available). For Oysters- Find open corner, carefully open each shell with paring Knife, saving juice (padded Oven Gloves recommended). Move to platter, sprinkle each with Lemon Juice and BBQ Dry Seasoning. Garnish with Toast, Lemon Wedges and Green Herb Garnish. Reblogged this on California Gold BBQ Rub Blog/Recipes.